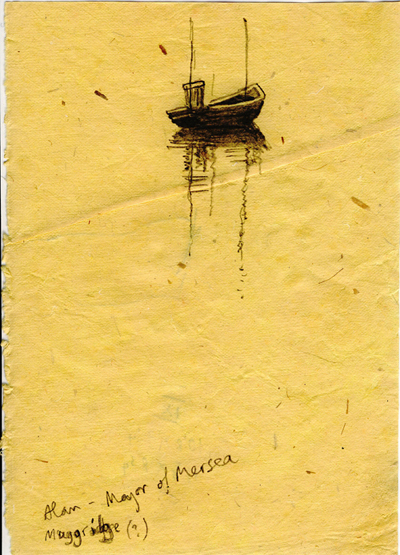 This drawing is from a sketch book I kept while I was painting in Mersea Island. I had my easel set up with my oil paints on the quay side in West Mersea Harbour. The sketch book next to me, ready to hand, to note quickly things in passing that caught my eye while I was painting. So it is full of fleeting incidents; sketches of dinghies being launched, washed down, rowed and sailing by. Out of all the pictures in the book, I picked this one to frame because it is so quiet and expresses a stillness and the fullness of the estuary at high tide and does so in just a few strokes marking the reflection of the boat in the water. I like this drawing because it has an oriental feel, economical in a Chinese or Japanese way, although the look of the drawing is European, soft graphite pencil on flecked, antique-looking paper, paper with a thin, pointed crease running vertically, a fault in the manufacture, at its centre. The boat seen in three quarter view from behind, is placed in the top left quarter of the page, which optically creates a distance. The prow curves upwards in a way which, when I was drawing it, made me think of a Turkish, Ottoman slipper turning up at the toe. Between the prow and the stern I was concerned to get the intervals and spaces – the ratio of the height to distance – of the masts and rectangle of the block house. This boat has particularly elegant proportions, even in foreshortening. I painted her a few times. There is a water colour of her side on, in profile, in one of the cabinets at the entrance to this exhibition at the Andromeda, which I shall talk about later. Of all the fishing boats that sail out of Mersea Island, this was the one whose lines always held my gaze whenever I caught sight of her. Just as I had finished this little drawing, I started talking with Alan Mogridge, the Mayor of Mersea, who introduced himself and told me a bit about the boat; that her skipper had bought her in Ostend and renamed her “Diana” in honour of his wife and childhood sweetheart, a big love story thereabouts that he implied was every bit local common knowledge. He then offered to take me out to the Oyster Shed in the middle of the estuary, which is why Alan, the Mayor of Mersea, with an attempt to spell his surname is written at the bottom of the page. When he went off to prepare the Yacht Club’s flat bottomed lighter, I wrote it on the drawing so as not to forget, as I am very bad with names. I had taken the picture out of the sketchbook to frame for Great Queen Street, but when Gerry Smith was talking about his plans for the exhibition at the Andromeda, and said he was planning a Boat Wall, I said that I had a very nice little drawing of a boat he might like to take a look at, to see if he wanted to include it or not. Gerry took it and framed it. He gave it a generous border, with a simple light hardwood moulding. And, for the moment, there the drawing hangs, with Ian Hamilton Finlay’s “Summer Sails” and the other boat pictures.